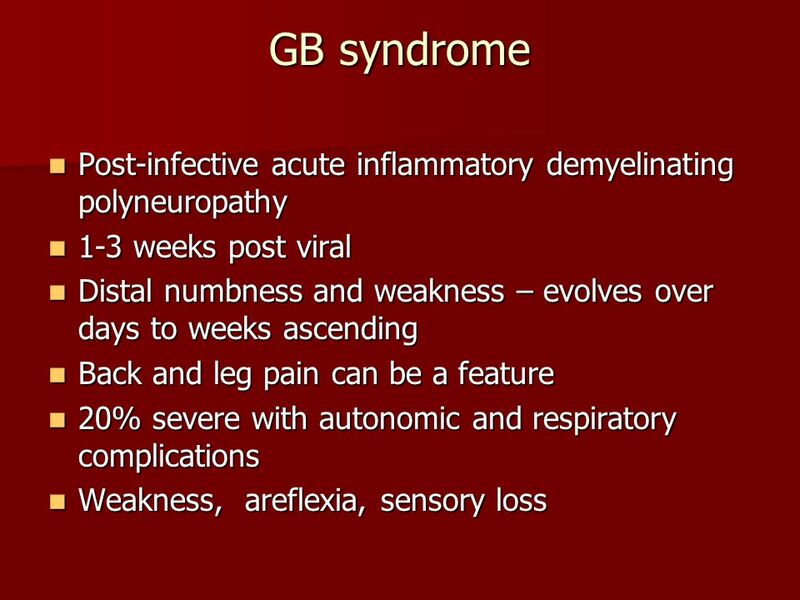 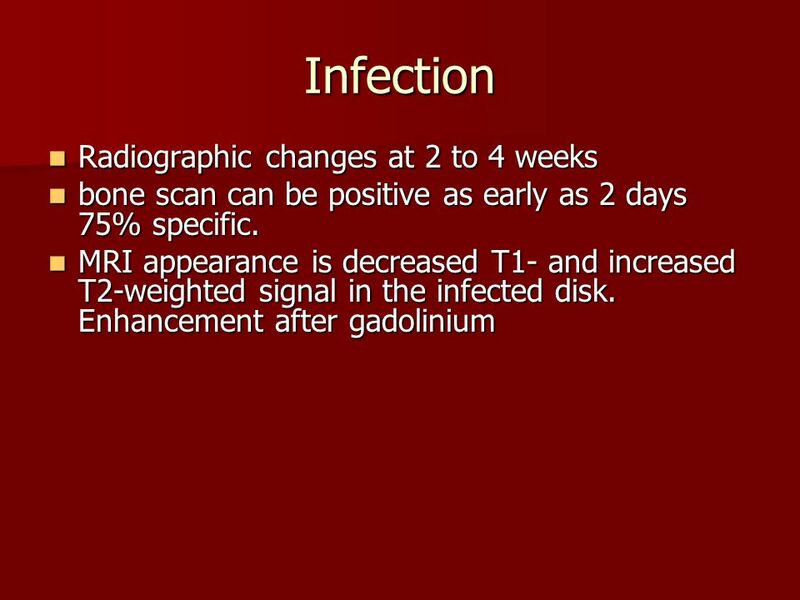 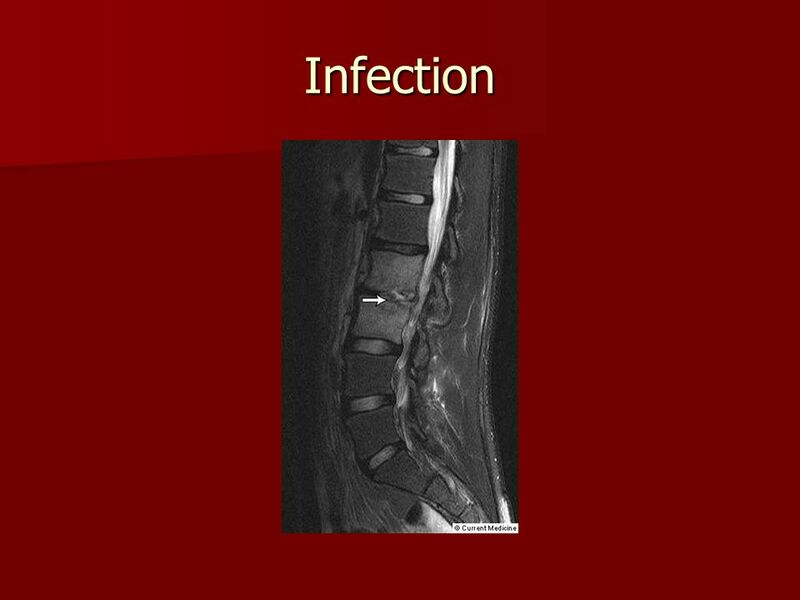 25 Infection discitis, osteomyelitis, and epidural abscess. 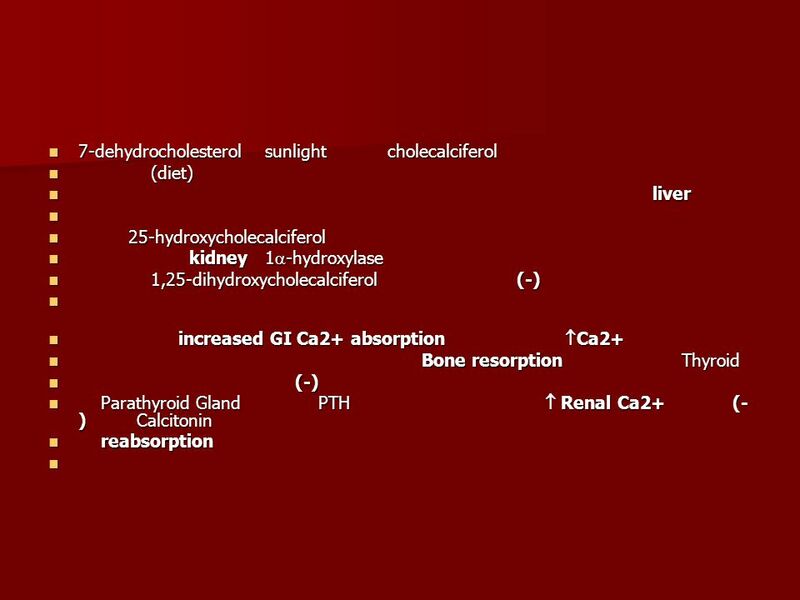 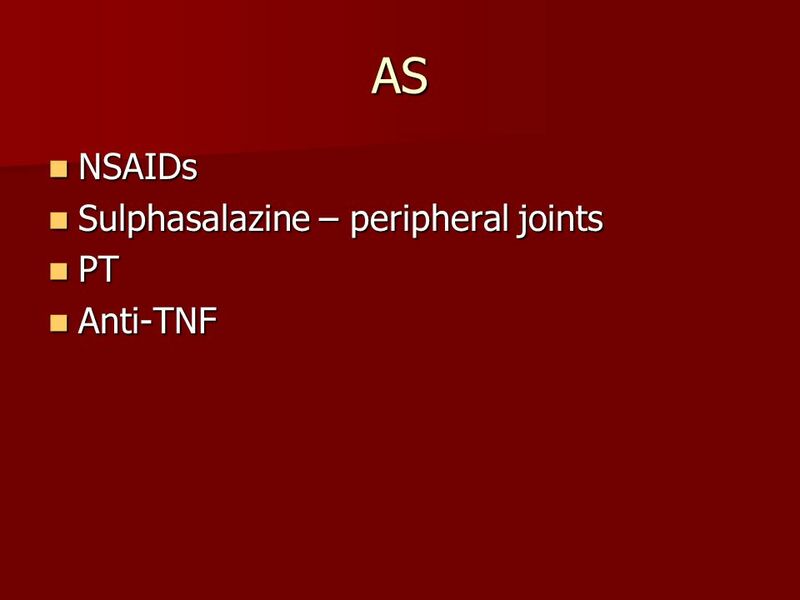 hematogenously spread most often Staphylococcus aureus. 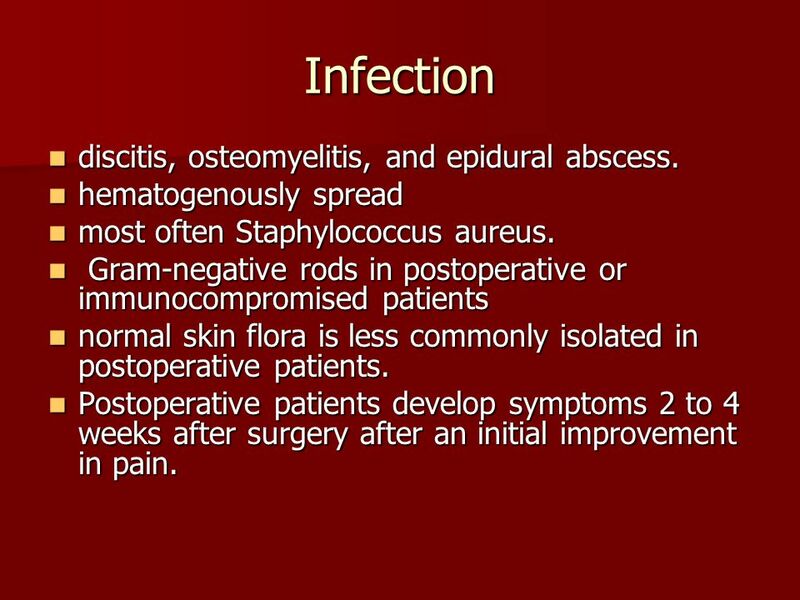 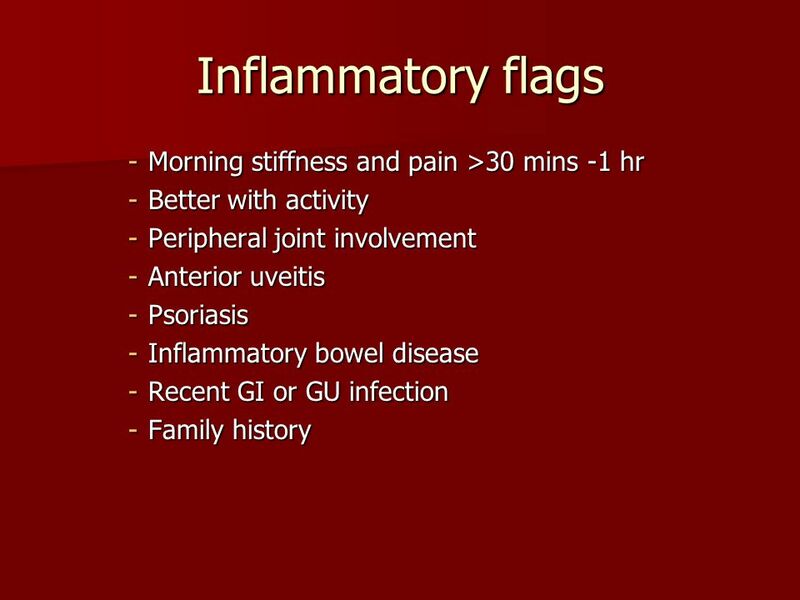 Gram-negative rods in postoperative or immunocompromised patients normal skin flora is less commonly isolated in postoperative patients. 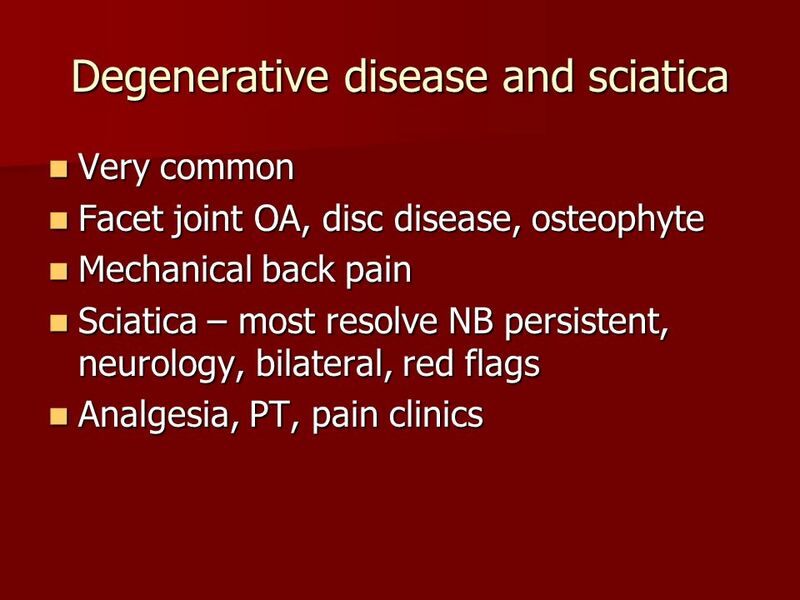 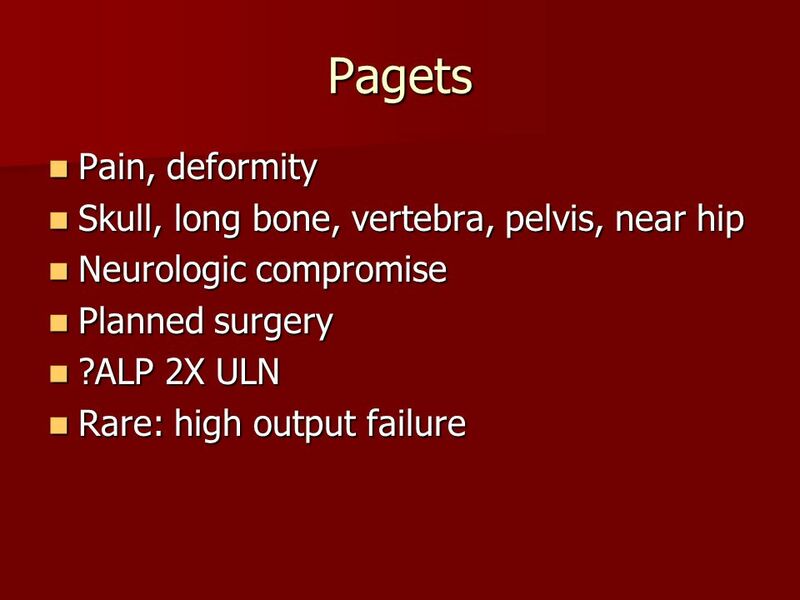 Postoperative patients develop symptoms 2 to 4 weeks after surgery after an initial improvement in pain. 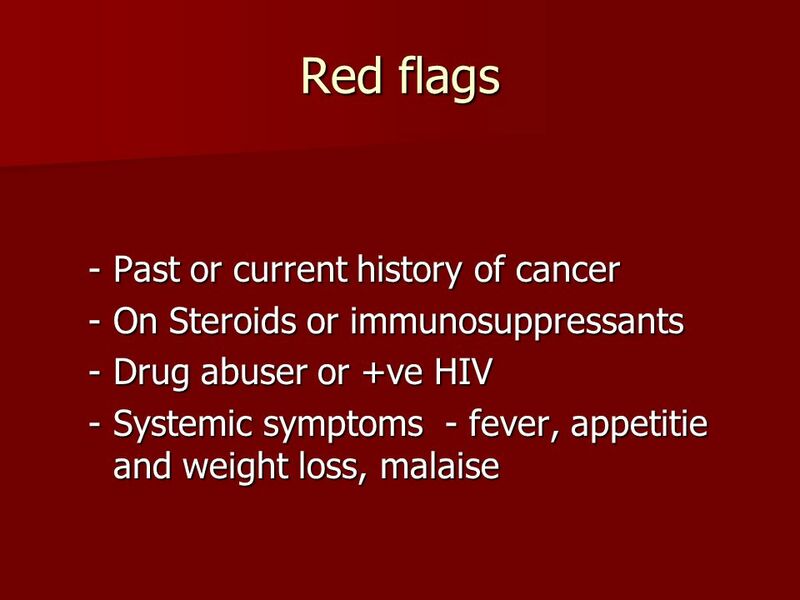 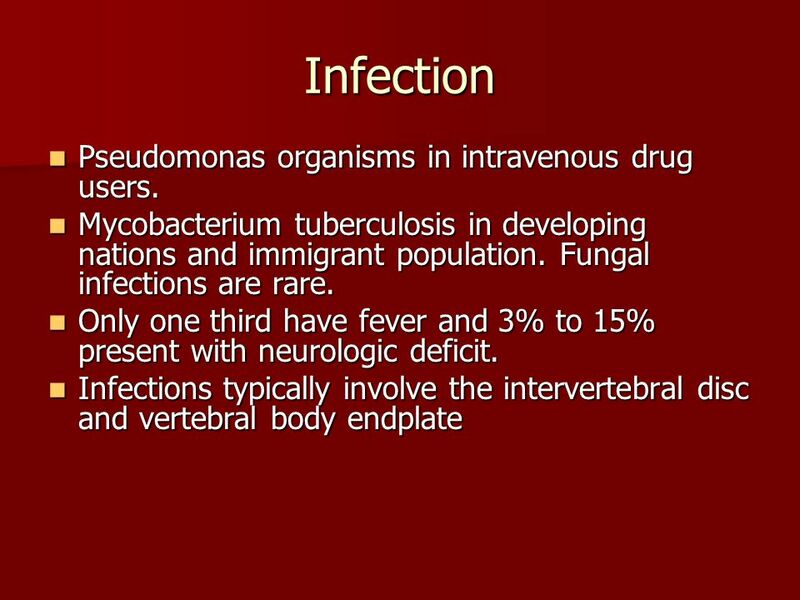 26 Infection Pseudomonas organisms in intravenous drug users. 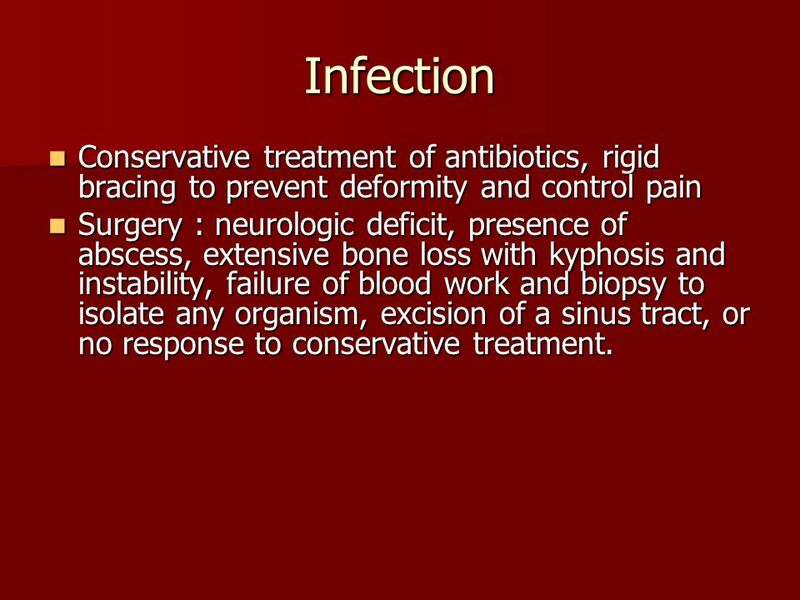 28 Infection Conservative treatment of antibiotics, rigid bracing to prevent deformity and control pain Surgery : neurologic deficit, presence of abscess, extensive bone loss with kyphosis and instability, failure of blood work and biopsy to isolate any organism, excision of a sinus tract, or no response to conservative treatment. 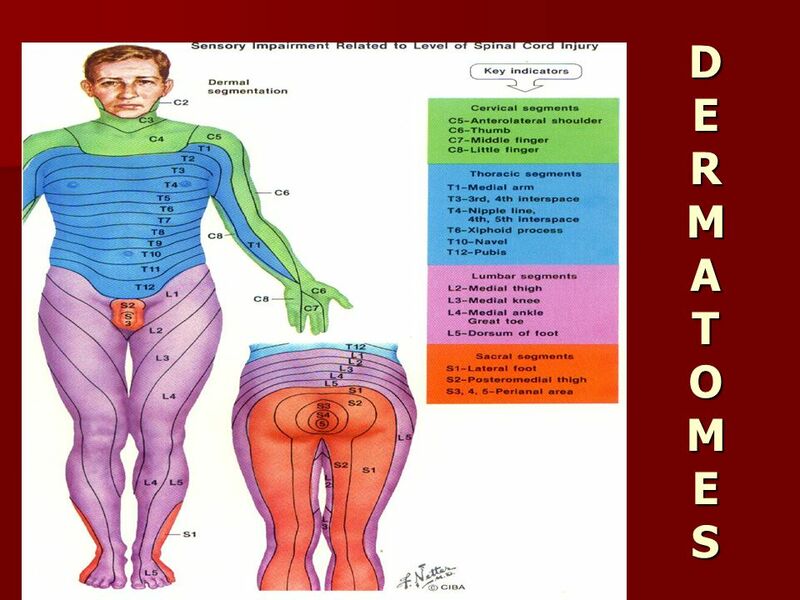 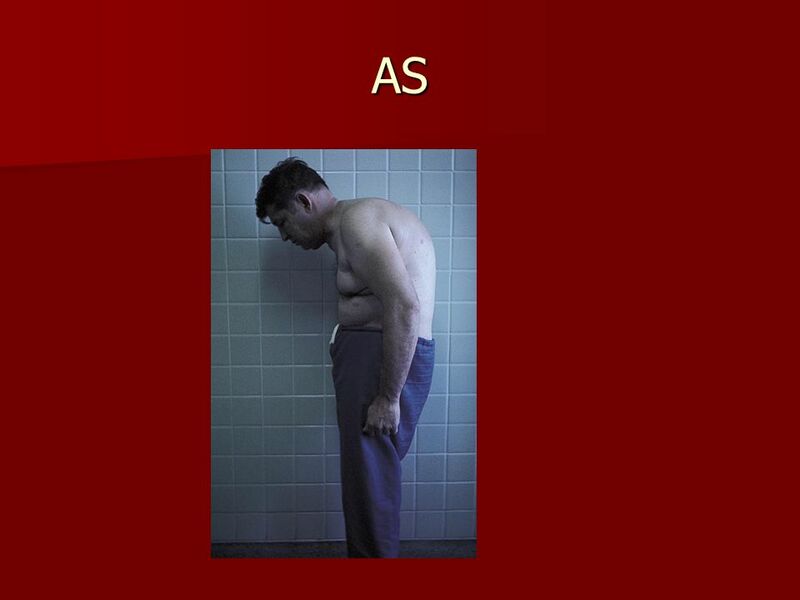 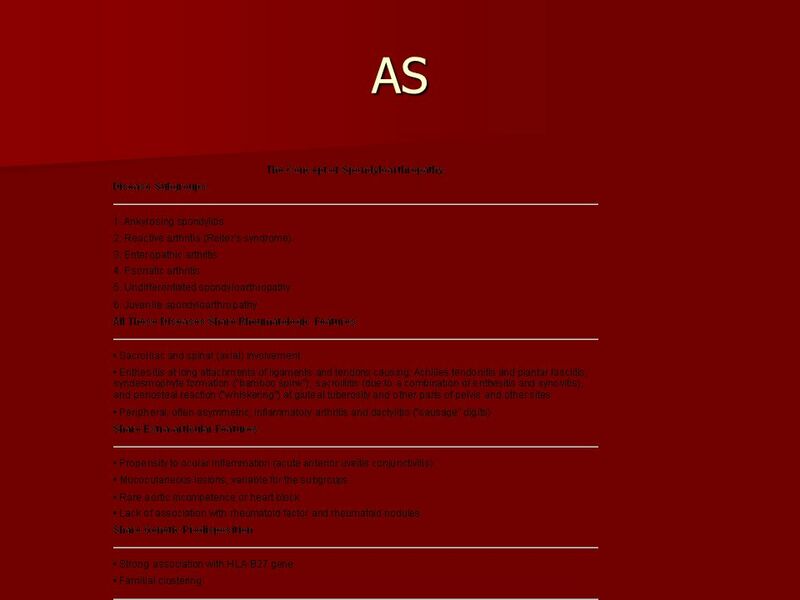 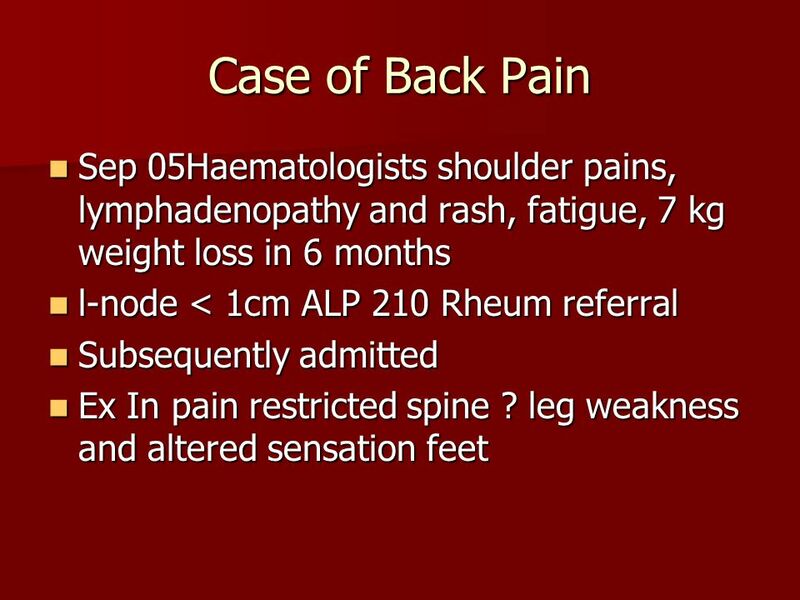 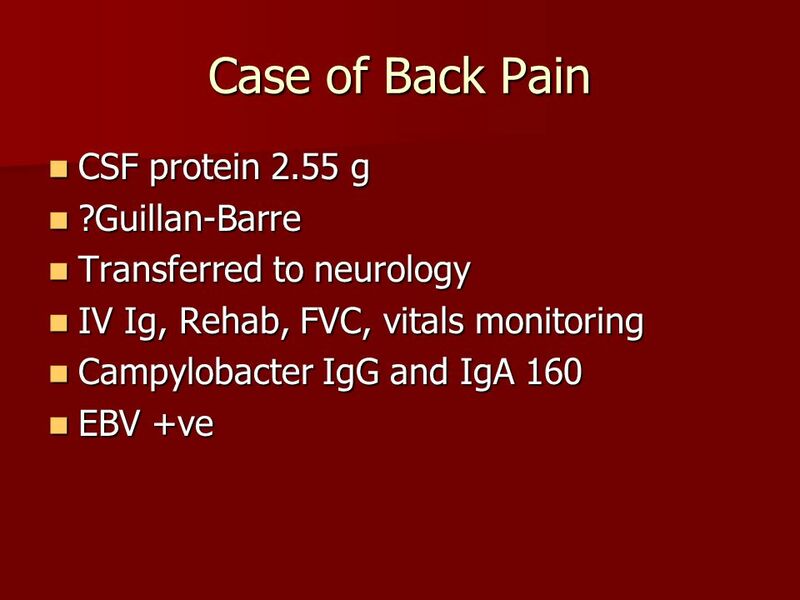 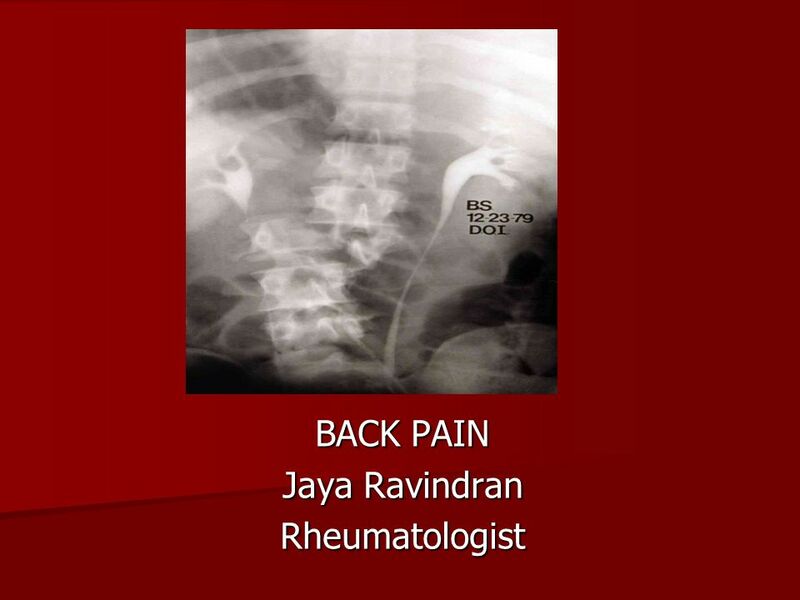 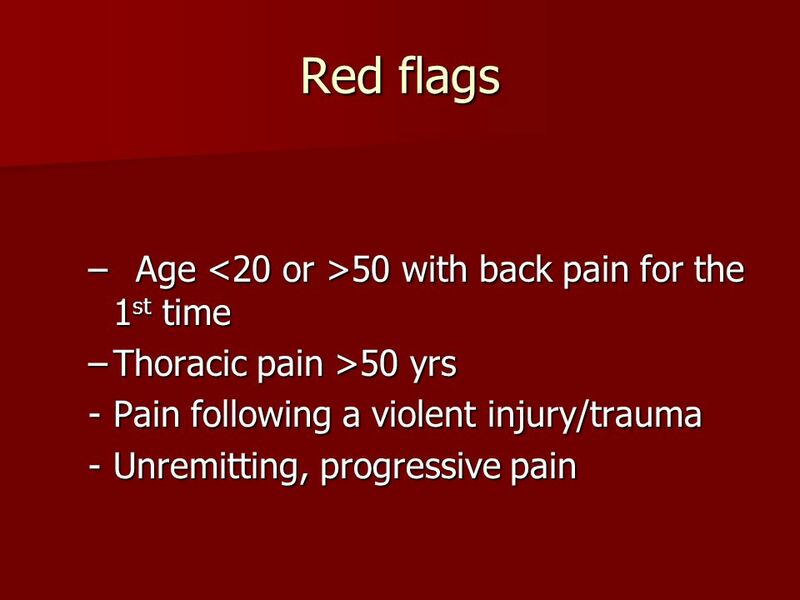 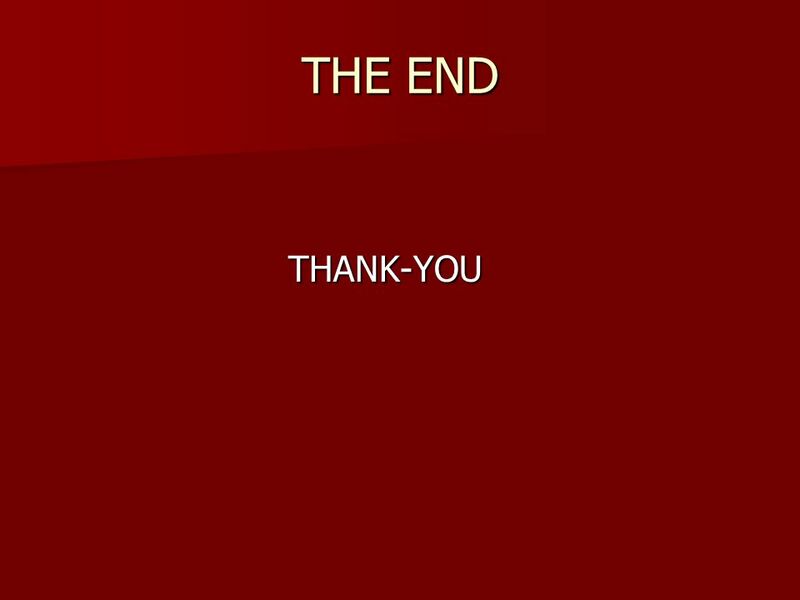 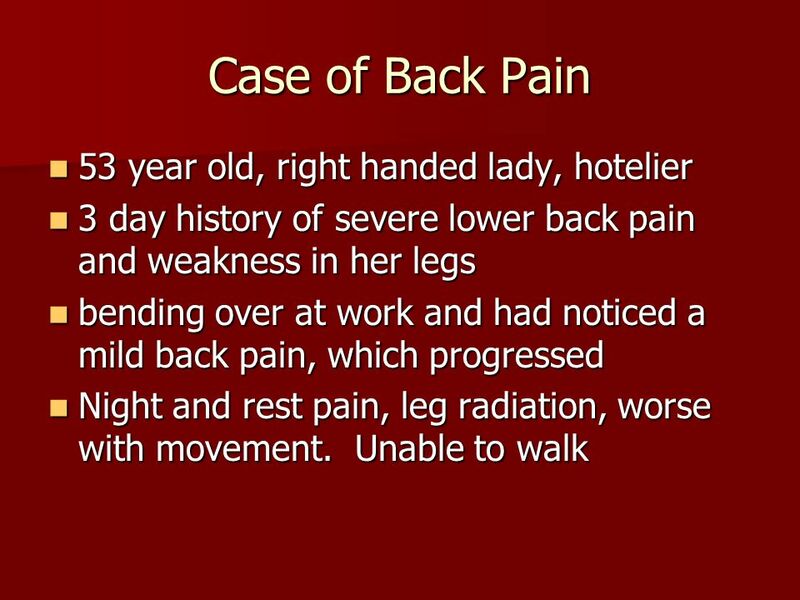 Download ppt "Case of Back Pain 53 year old, right handed lady, hotelier"
Back Pain Examination, assessment, red flags, Good Back Guide. 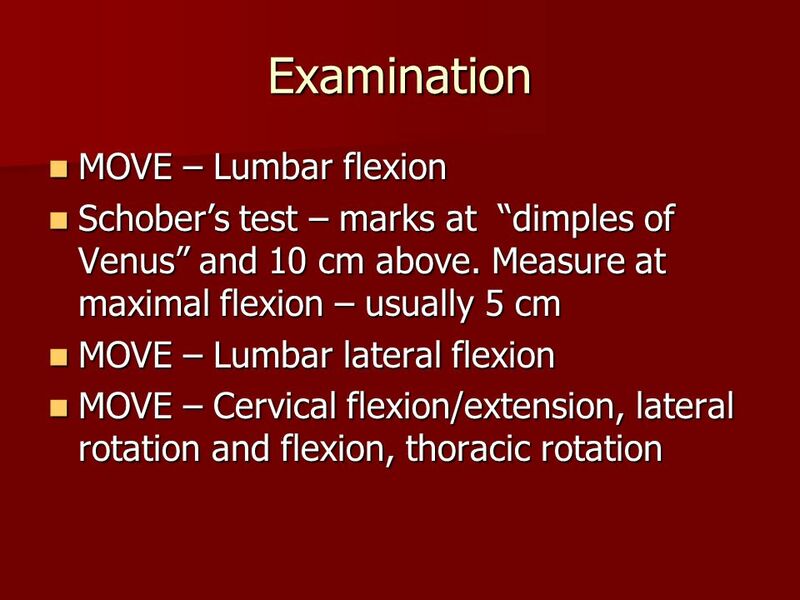 Spine Examination Himanshu Sharma Himanshu Sharma. 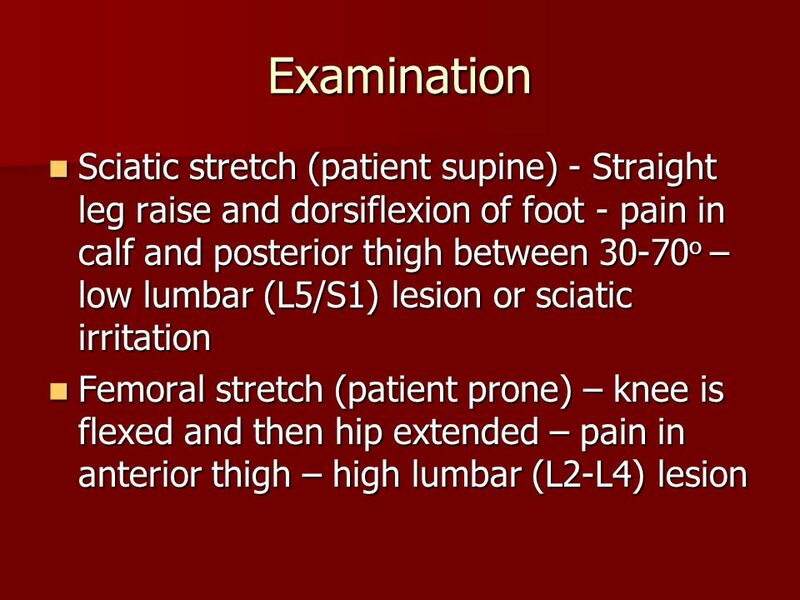 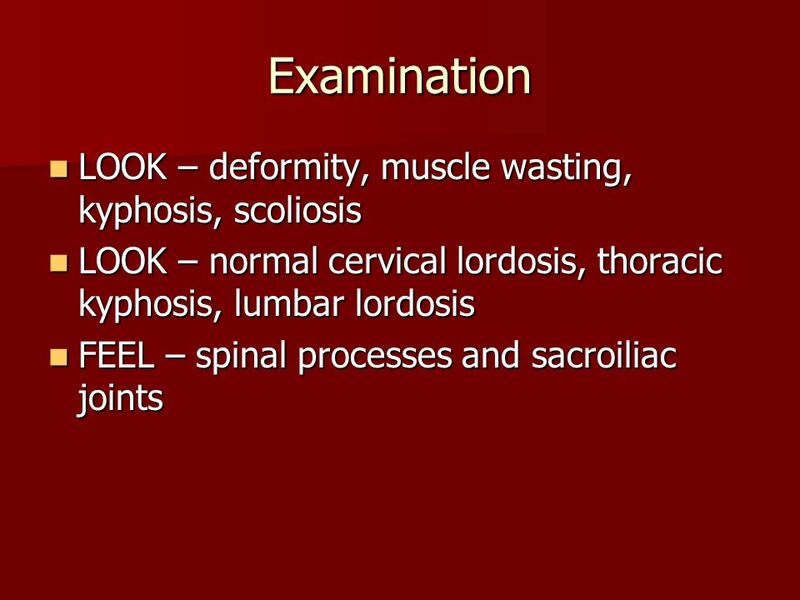 Evaluation of back pain and other disorders of the Spine. 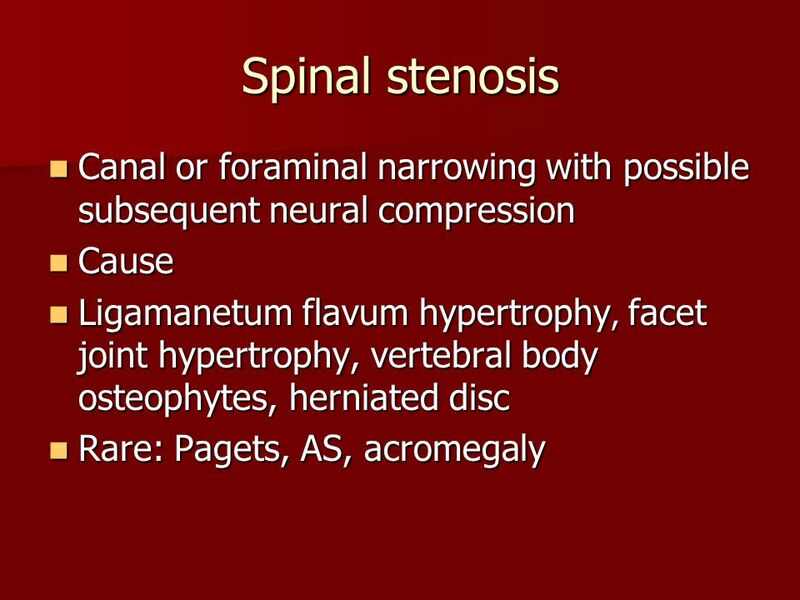 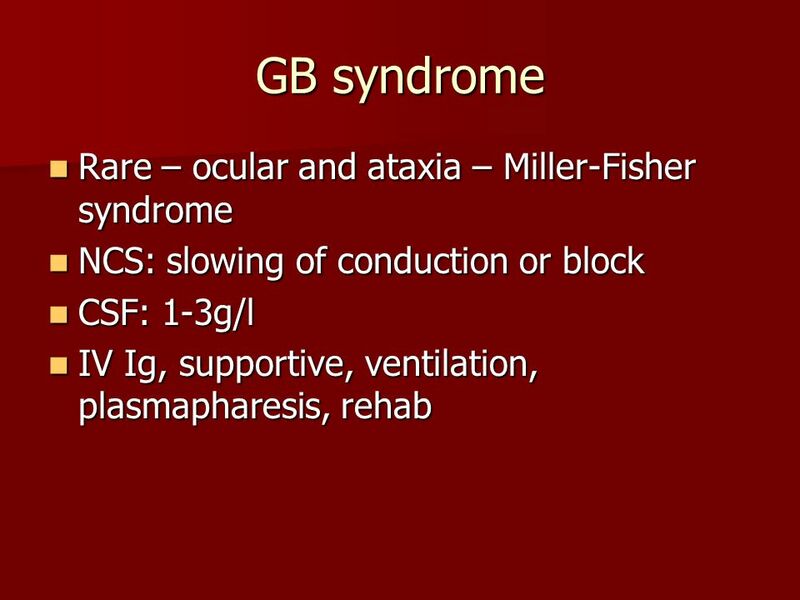 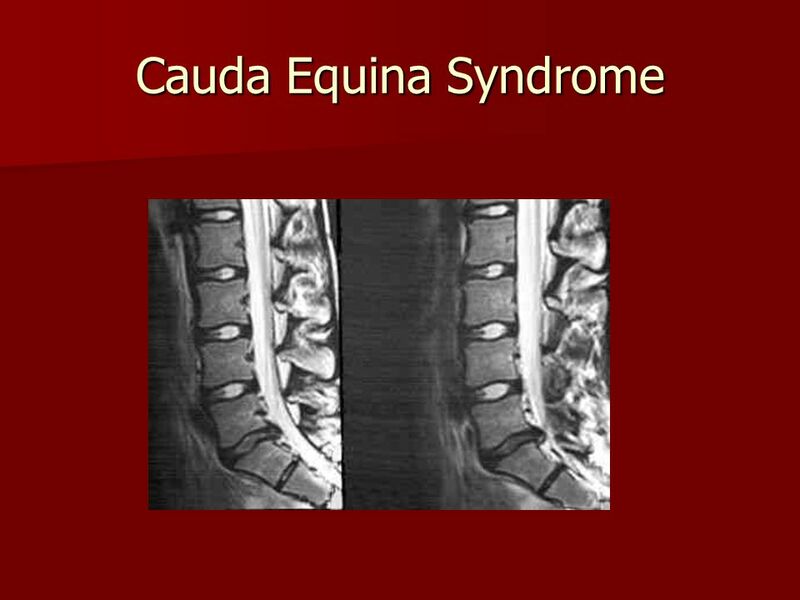 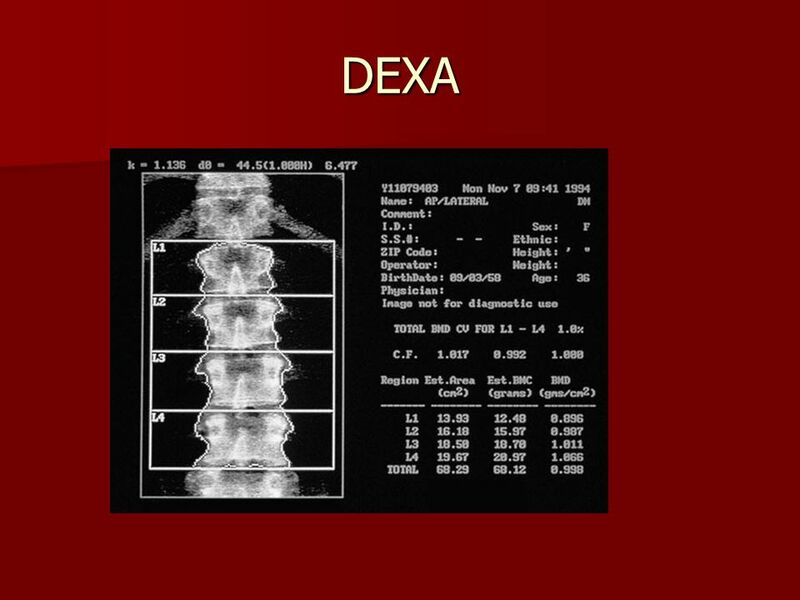 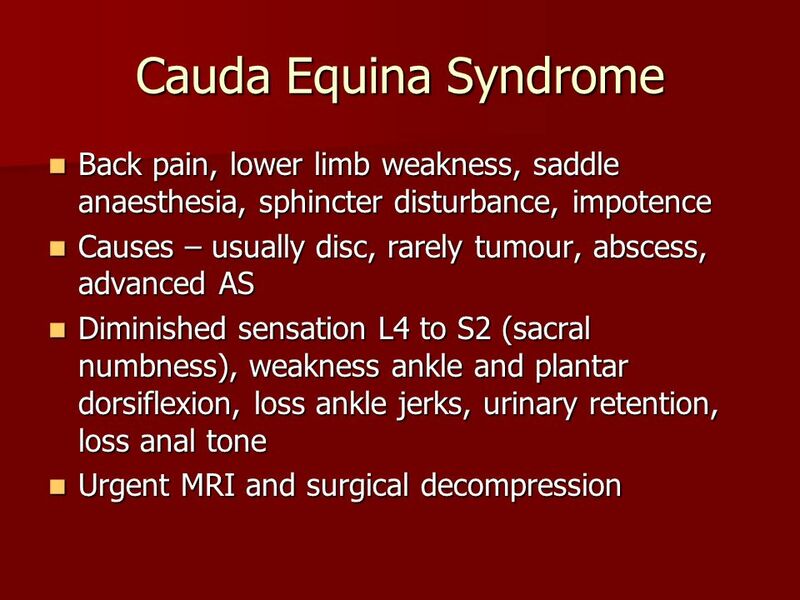 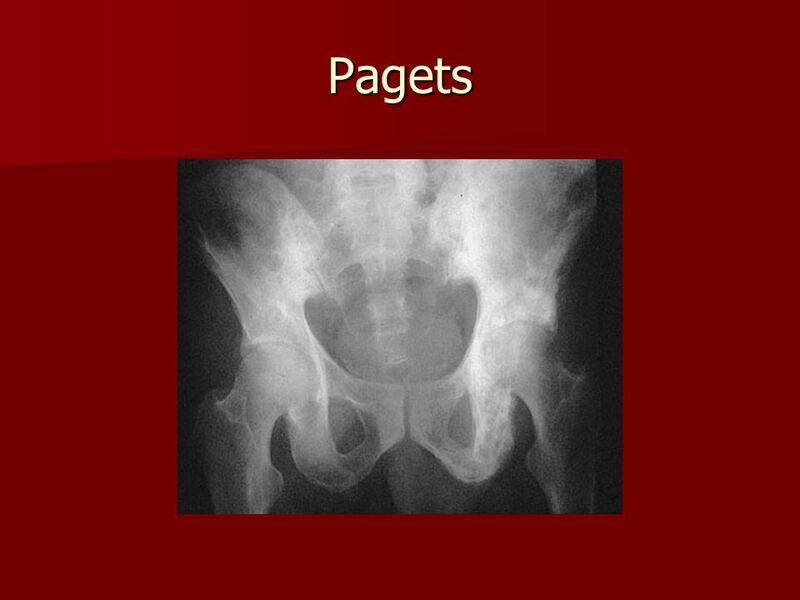 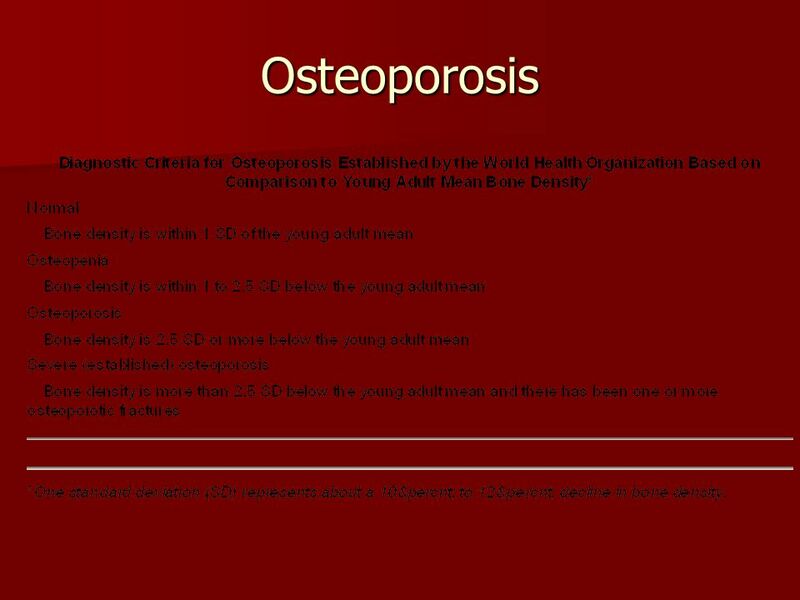 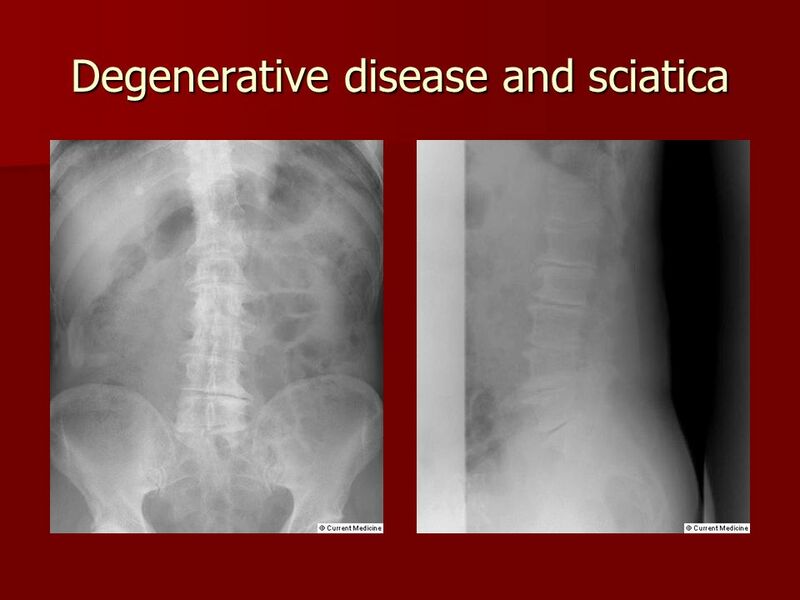 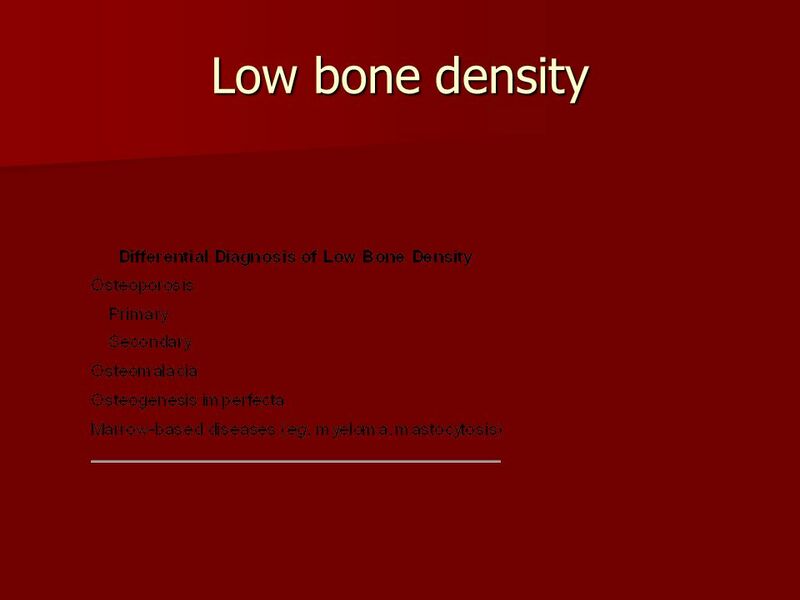 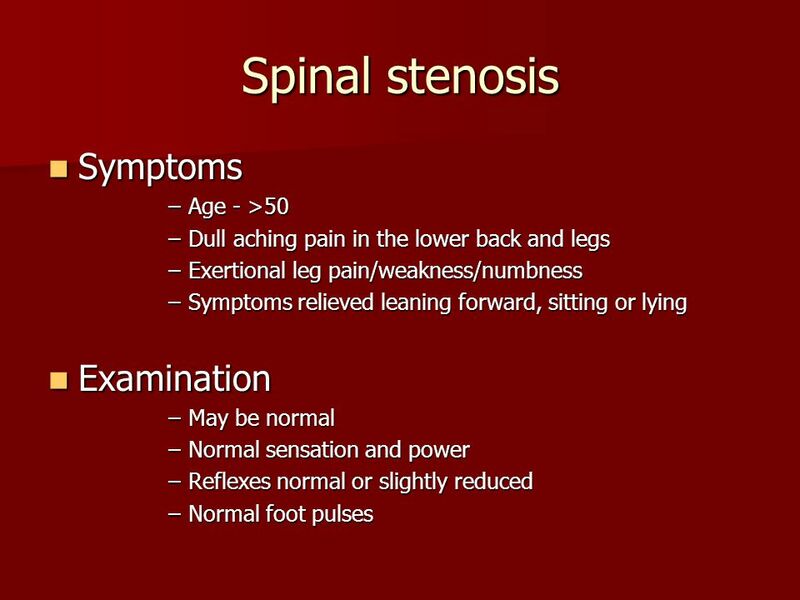 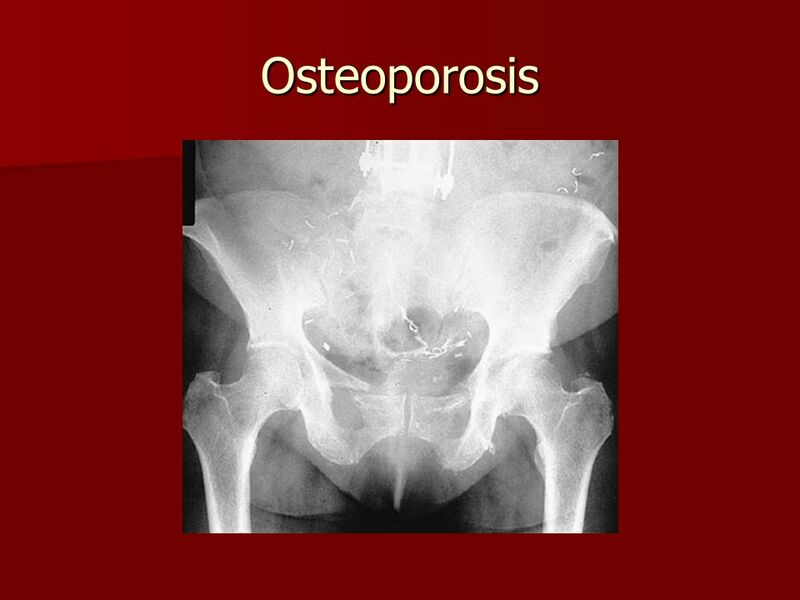 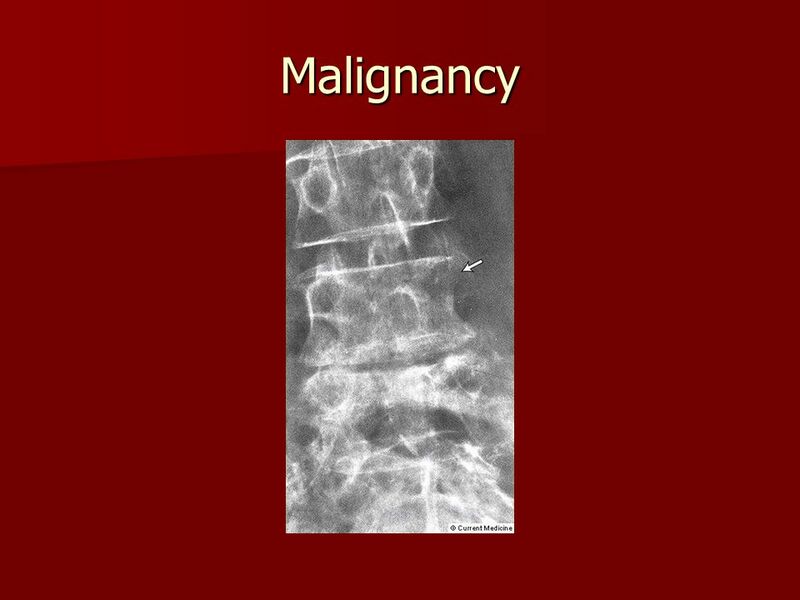 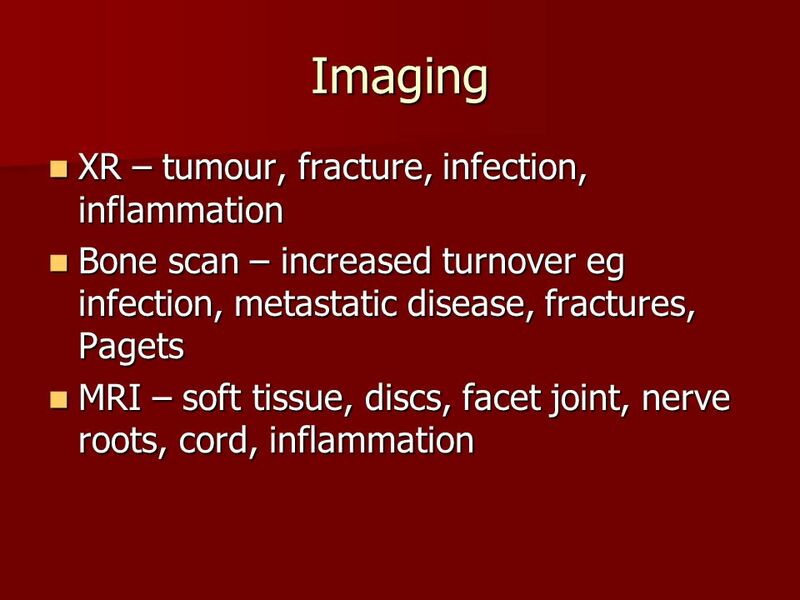 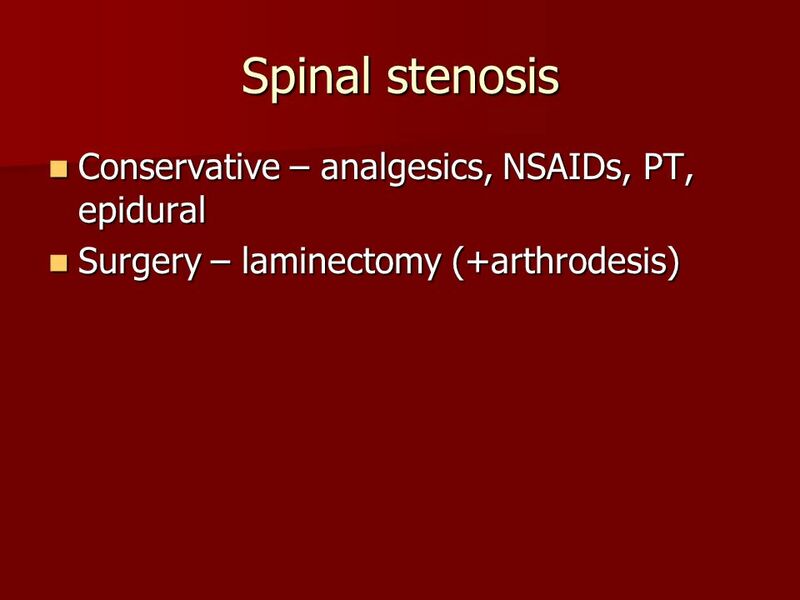 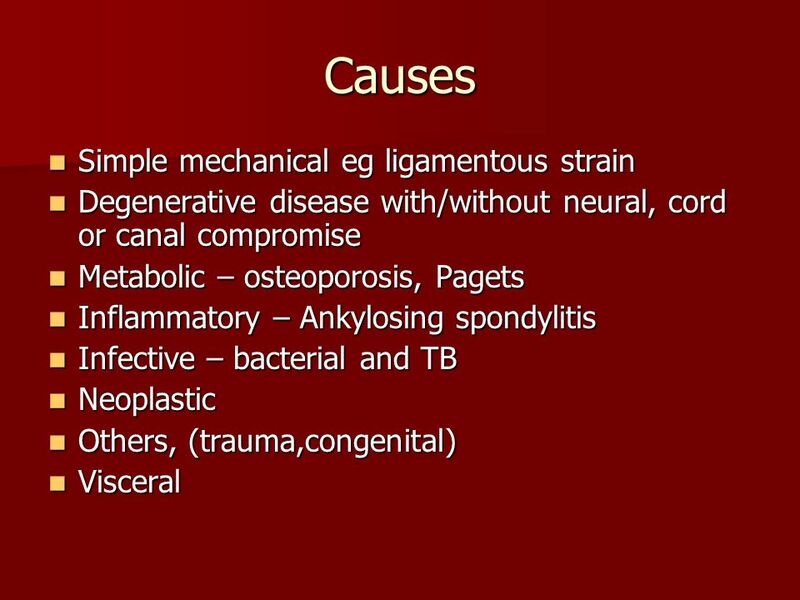 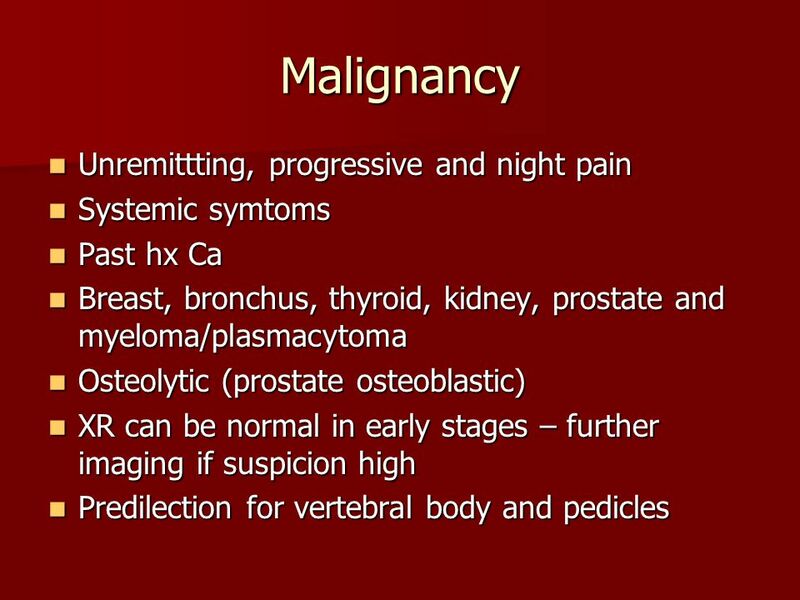 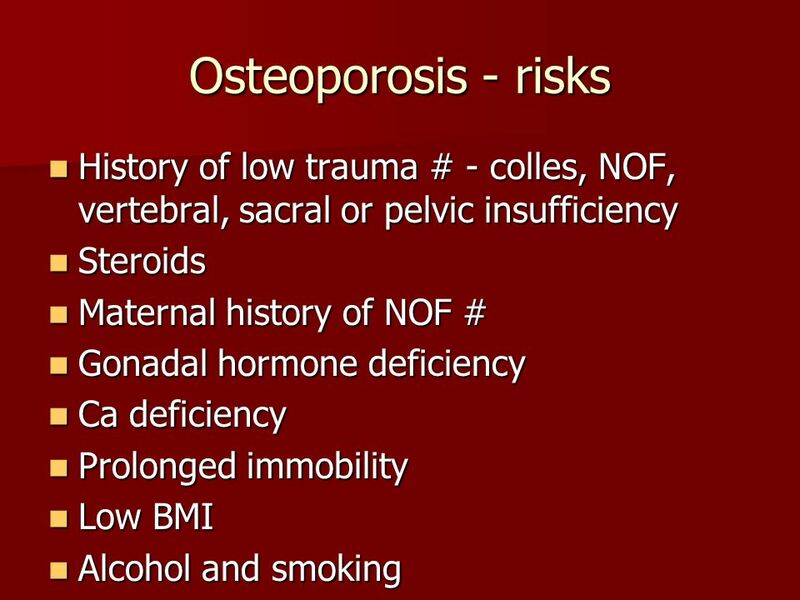 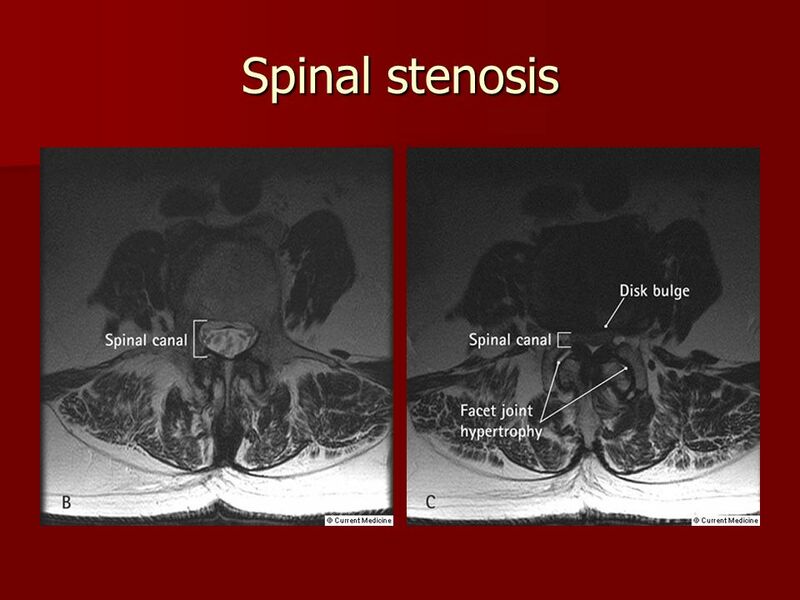 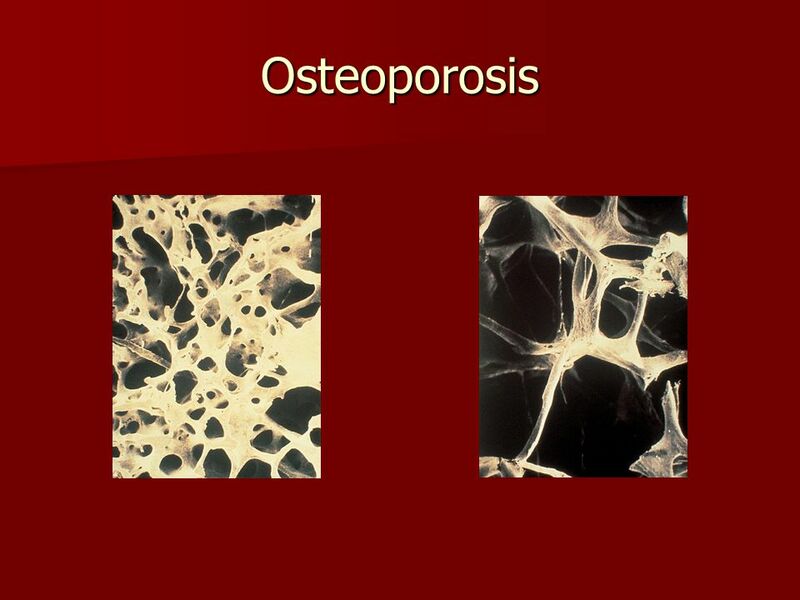 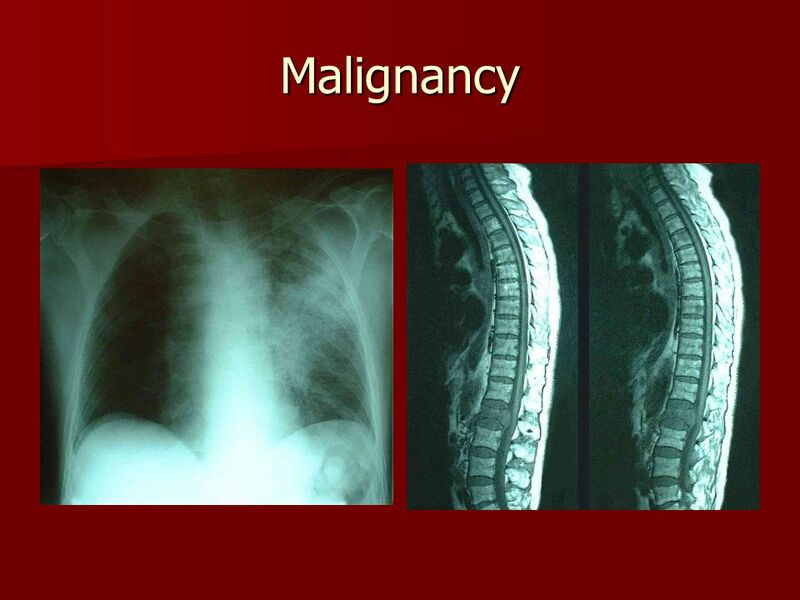 Causes of Stenosis Degenerative spondylo-listhesis Facet subluxation and hypertrophy Pagets disease Tumour Facet joint cyst Congenital- achondroplasia. 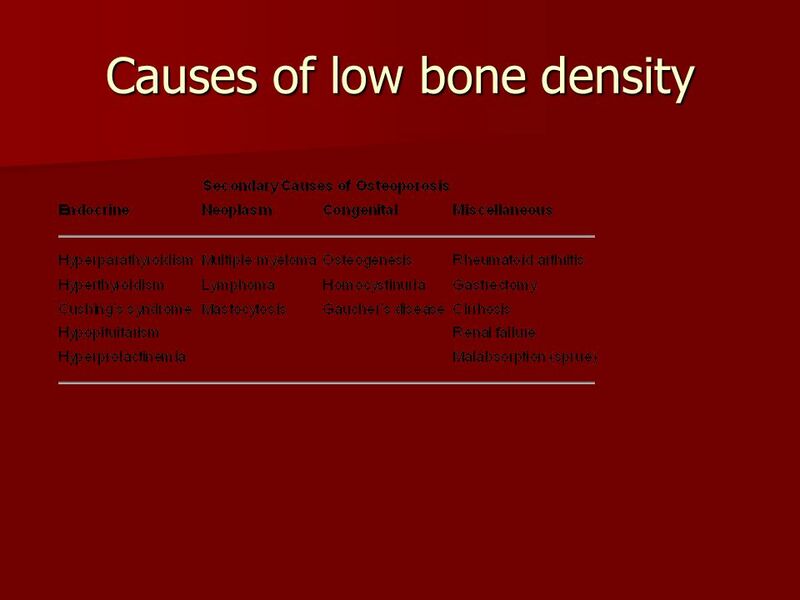 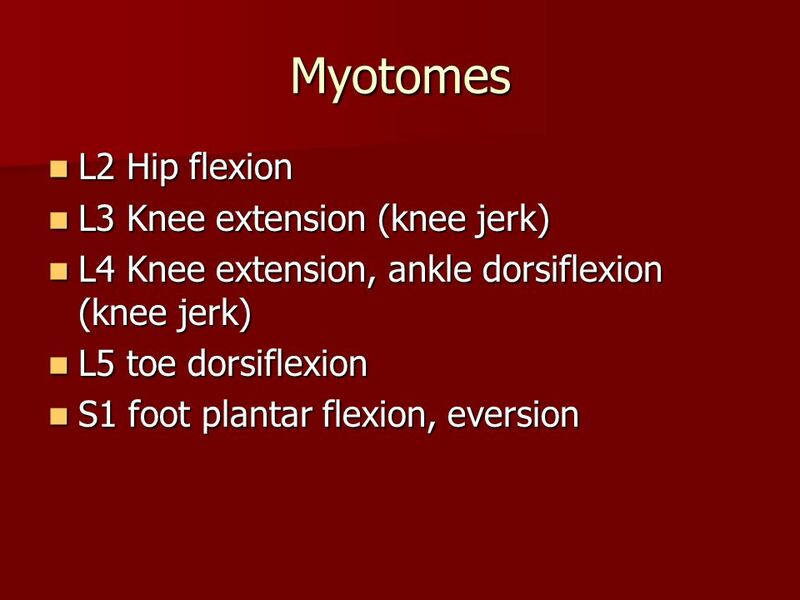 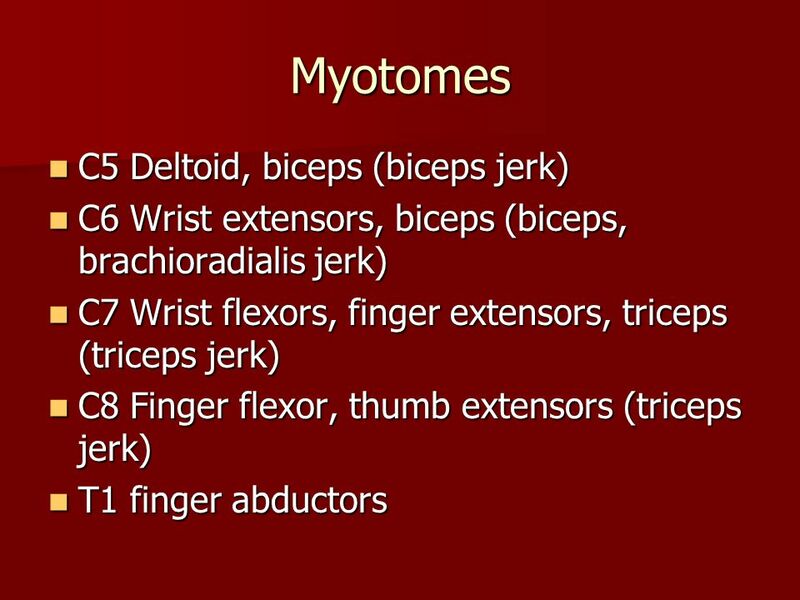 Skeletal System Diseases and Disorders. 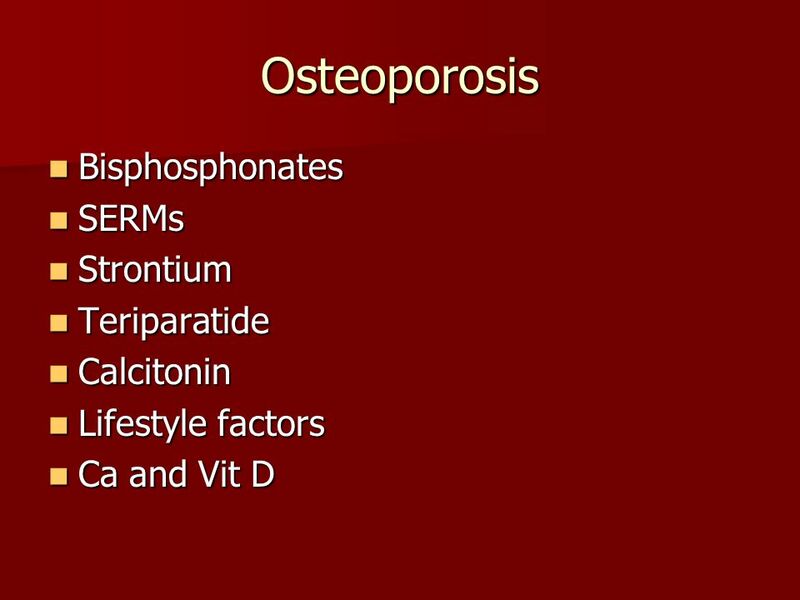 Arthritis Rheumatoid Rheumatoid Osteoarthritis Osteoarthritis Juvenile Rheumatoid Arthritis Juvenile Rheumatoid. 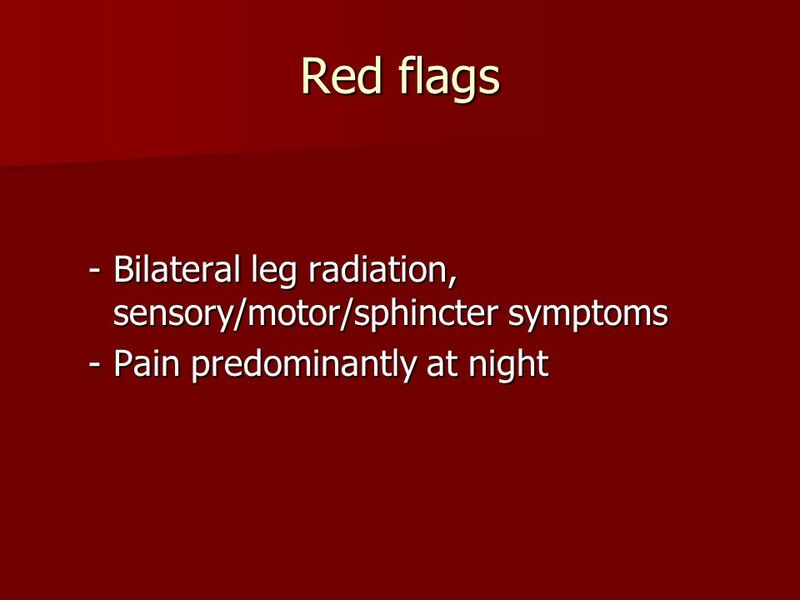 4 patients with pains in their legs………………. 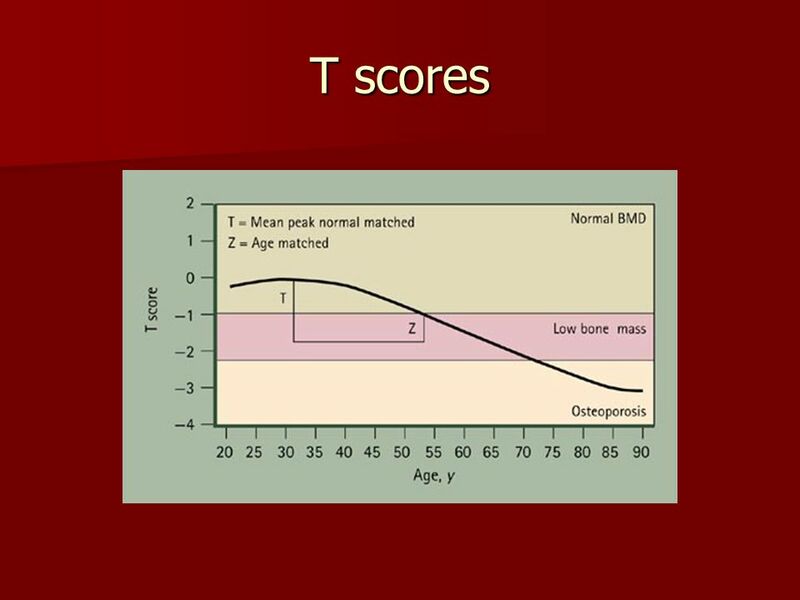 Mr H 65 years of age Type II Diabetes Developed shortness of breath when walking the dog Worse when he is climbing. 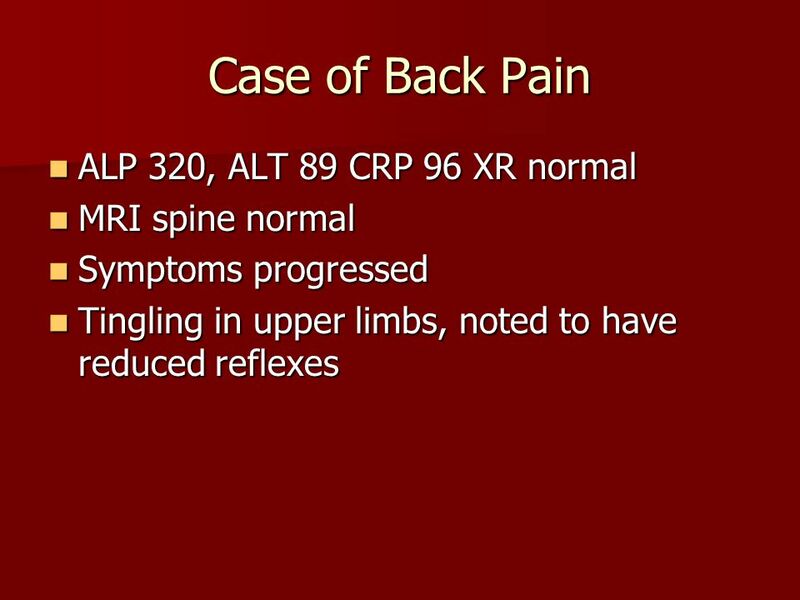 Spinal pain. 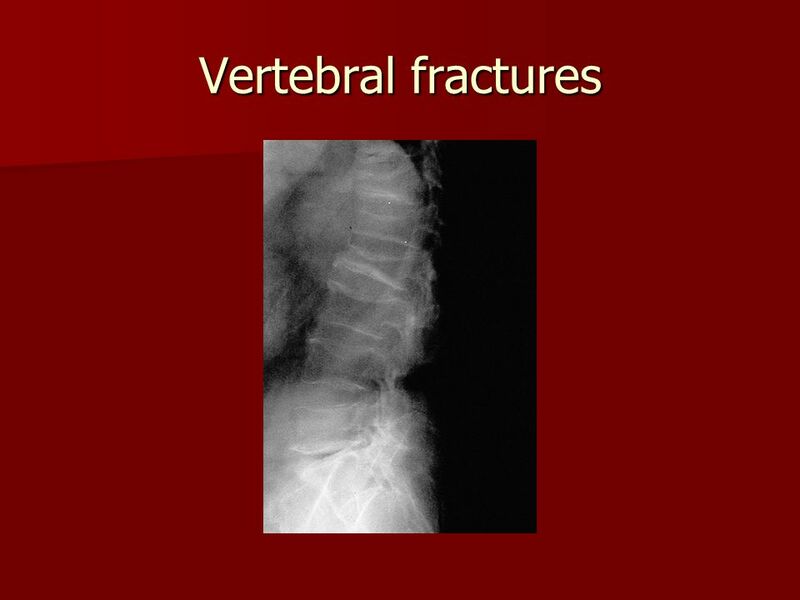 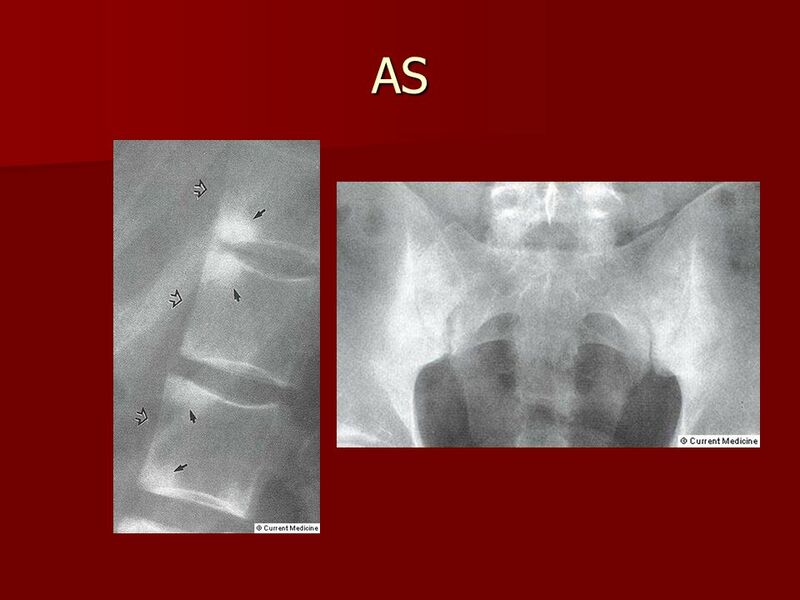 Case 1 Mr John Brown is 52 years of age He develops acute severe back pain after digging a tree out of his garden Two days later he has pain. 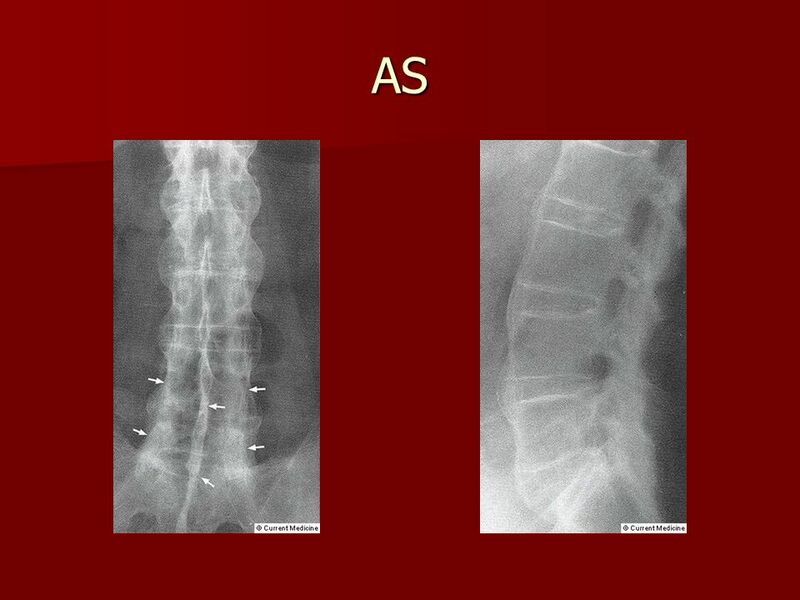 September 5th – 8th 2013 Nottingham Conference Centre, United Kingdom www.nspine.co.uk.